Most websites have one navigation menu bar. Pages of the navigation menu might be configured to only be visible to specific users or a browsing session, but all public and private pages are a part of one navigation menu hierarchy. Some websites may need multiple navigation menus with different pages on each menu. For example, a website owner may prefer to include unique footer links for pages that share information regarding their "Terms, Privacy, Contact Us, or Jobs" information, and do not prefer to have these links be displayed in the main navigation menu with the Home, Services, and Products pages. 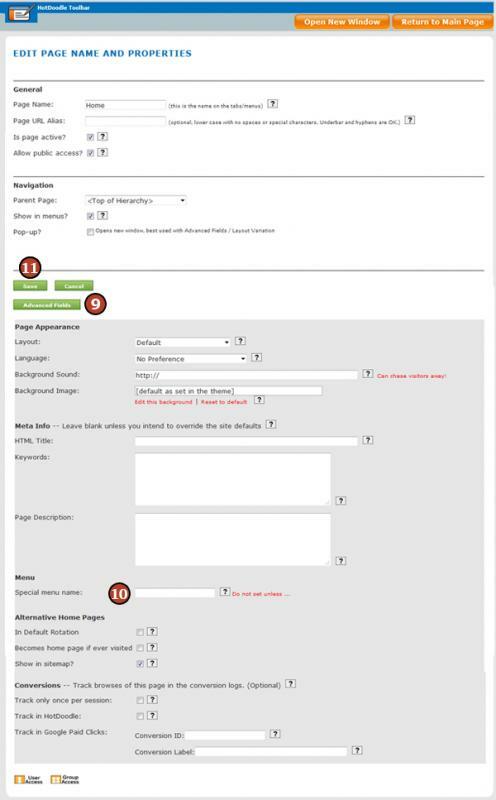 The Hand-Built Special Menu approach is not dynamic because navigation pages do not automatically update as pages are renamed or moved; therefore, this is not the recommended method to create and manage special menu pages. The Dynamic Special Menu approach is dynamic because navigation pages automatically update on the navigation menu as pages are renamed or moved; therefore, this is the recommended method to create and manage special menu pages. 2. Click to add a checkmark in the box next to "Configure Blocks" under the Click to Preview button. 3. 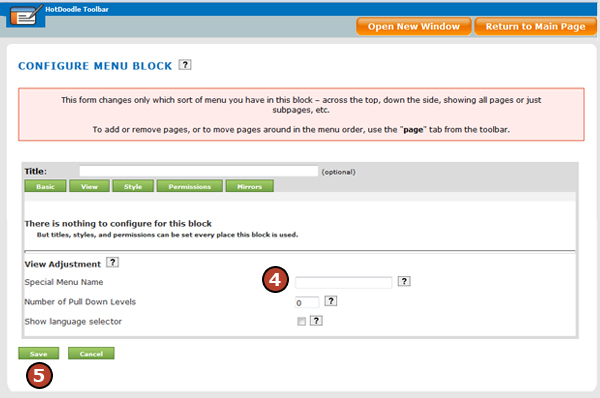 Click on the "Configure" icon above the Menu Block. 4. Type a name in the [Special Menu Name] field. This exact name (keystrokes and capitalization) will need to be added to all pages that will display in this special menu. If a page intended for the special menu is created as a sub-page of a page on the main navigation menu, the special menu page will not display in the special menu as intended. The page must either be set to show at the Top of the Hierarchy or as a sub-page of another page already on the special menu. 7. On the HotDoodle Toolbar, click on the "Pages/Menus" tab. 8. Click on the "Edit Page Properties" button. 10. Type in the exact special menu name in the [Special Menu Name] field. This exact name (keystrokes and capitalization) will need to be added to all pages that will display in the special menu. 12. Repeat steps 7-11 with all pages to display on the special menu. With the addition of special menus, the navigation page hierarchy can become complex. 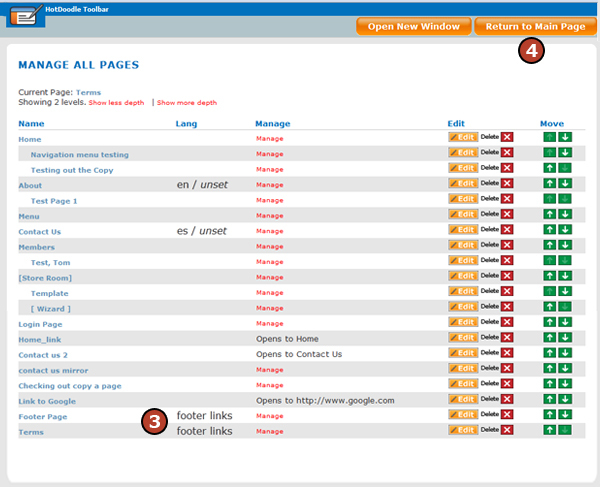 To view all pages and see which are assigned to display in the special menu, use the Manage All Pages function. 1. From the HotDoodle Toolbar, click on the "Pages/Menus" tab. 2. Click on the "Manage All Pages" button. 3. All Special Menu pages will list the special menu name under the Lang category. 4. Click on the "Return to Main Page" button. Using the value LANG is particularly useful in blocks that are mirrored or are in multi-page containers because the same block will have different LANG values depending on where it is located. Used properly, a menu on a "fr-ca" page will display only "fr-ca" pages.